A new batch of several yearbooks are now available and online at DigitalNC, courtesy of our partner, Central Piedmont Community College. 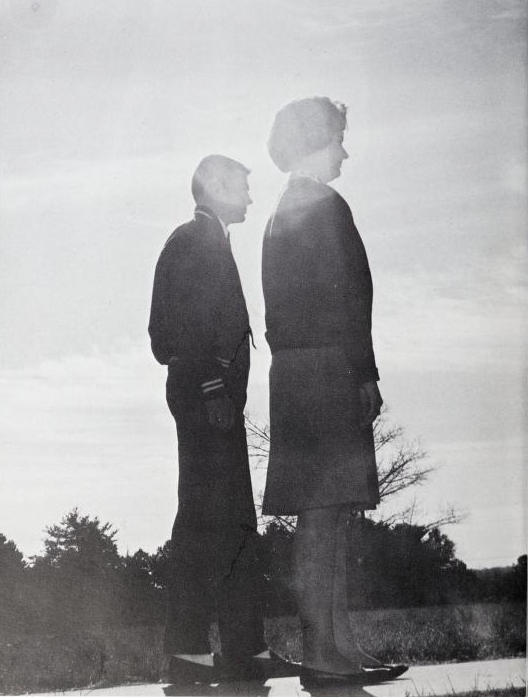 Dating periodically from 1962 to 1978, a few of these yearbooks date back to when CPCC was actually two institutions – the white Central Industrial Education Center and the black Mecklenburg College. Several of the yearbooks also specifically focus on CPCC’s Dental Hygiene Department. 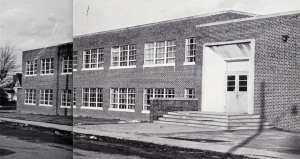 In July 1964, Mecklenburg College became Central Piedmont Community College, which still stands today. 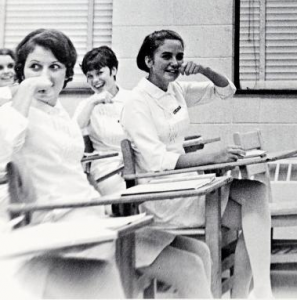 The later CPCC yearbooks, editions of The Violet Ribbon and Ordontos, are published for the Hygiene Department, highlighting their instructors, the department head, and students. Focusing on one department, these yearbooks are a valuable resource into an important part of the CPCC community. To see more from Central Piedmont Community College, check out their partner page or visit their website. Click here to view other digitized material from CPCC, including other yearbooks, course catalogs, and scrapbooks noting CPCC’s history. A new family genealogy history from Gaston County has been added to DigitalNC, courtesy of our partner, the Gaston County Museum of Art & History. 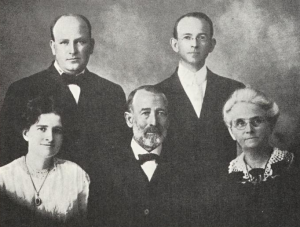 The book, Our Kin, Being a History of the Hoffman, Rhyne, Costner, Rudisill, Best, Hovis, Hoyle, Wills, Shetley, Jenkins, Holland, Hambright, Gaston, Withers, Cansler, Clemmer and Lineberger Families, was originally published in 1915, but has been reprinted by the Gaston County Historical Society several times since and is now digitally available for all to read. The book focuses on the individual families of Gaston County, including their common ancestors dating back to the 18th century. Many of the family members noted have long descriptions of who they were, what they accomplished in life, how their family names changed over the years, and more. This copy is quite special, as it has retained notes and highlighted terms that one of the authors made in his original edition, preserved in this reprinted version. Written by Laban Miles Hoffman of Dallas, North Carolina, this book was conceived as a history of his own family, but rapidly grew into an exploration of the histories of all the associated families in his genealogy. He includes a short preface of his own personal story, how he grew up in Lowell, North Carolina, studied at Davidson College, and later went to work in Raleigh under Governor Holden before moving to Arkansas. As a record of ancestors for over a dozen local families, it is a valuable resource for Gaston County historians, Gaston County residents, and family descendants. We are privileged to make it available on DigitalNC. To learn more about the Gaston County Museum of Art & History, visit their partner page or their website. A new batch of over two dozen yearbooks from Greensboro High School has been digitized and made available on DigitalNC, courtesy of our partner, the Greensboro History Museum. Dating from 1910 to 1958, this collection includes annual yearbooks, a 1906 copy of the Greensboro High School Magazine, and several issues of Homespun, Greensboro High School’s literary magazine dating back to the 1920s and 1930s. These yearbooks include individual portraits, class portraits, photos of faculty, and more. They also highlight photographs of student activities, social clubs, the school’s orchestra and band, the school’s sports teams, and more. This batch also includes copies of magazines that students worked to write, edit, and publish. 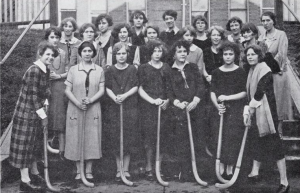 The Greensboro High School Magazine, the first of its kind to be uploaded to DigitalNC, was published three times a year by the students, and included editorials, short stories, and more. One student wrote about his experience riding along with Presidential candidate William Jennings Bryan as he was traveling throughout the South, for example. The school’s other magazine, Homespun, highlights the writing and literary accomplishments of the students, including smaller fictional short stories, poems, 1-act plays, and more. To learn more about the Greensboro History Museum, you can find more information by visiting their partner page or taking a look at their website. 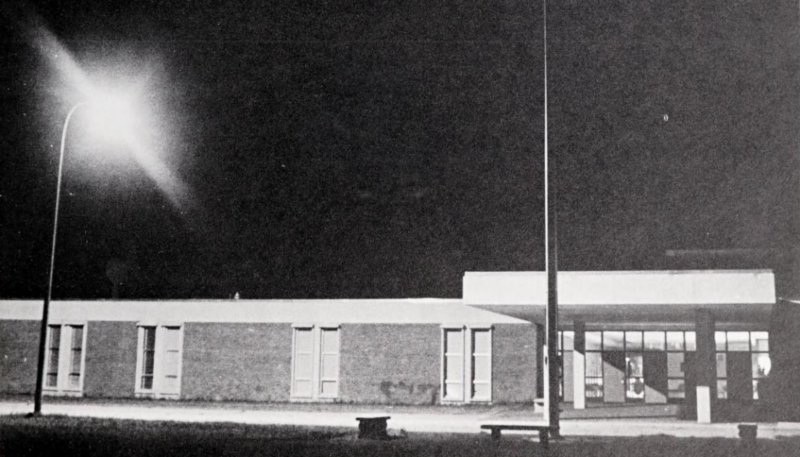 An exterior nighttime photo of Southern Nash High School in Bailey, N.C., 1968. A new batch of yearbooks from Nash County are now available on DigitalNC, courtesy of our partner, the Braswell Memorial Library in Rocky Mount, N.C. In this collection are over half a dozen yearbooks from the 1940s through the 1960s from across Nash County, including Spring Hope and Bailey, North Carolina. These yearbooks include individual portraits, class portraits and more. They also include photographs of student activities, clubs, student proms, and school sports teams. These yearbooks highlight different parts of the student bodies including student council, bus drivers, second language studies, homecoming courts, and more. These yearbooks from Nash County give us fascinating insights into what life was like for high school students in the middle of the 20th century. To see more materials from the Braswell Memorial Library, visit their partner page or check out their website. A new batch of yearbooks from Randolph County are now available on DigitalNC, courtesy of our partner, the Randolph County Public Library. Included in this collection are over 30 yearbooks from Randolph County schools across the area from the 1930s to 1960s. Also included are over a dozen yearbooks specifically from Liberty High School in Liberty, North Carolina. These yearbooks contain individual portraits, class portraits, as well as photographs of student activities, sports teams, faculty and clubs. Some of the yearbooks also include class poems and class songs, class and school histories. Readers can also find “last wills and testaments”, where the graduating class leaves behind objects or memories to the next class, and class prophecies, where the students imagined where they would be in the future. This new batch of yearbook is a valuable addition to DigitalNC, having these yearbooks illustrate what life was like across Randolph County in the 20th century. To see more from the Randolph County Public Library, check out their partner page, or visit their website. Over 50 new maps and blueprints have been digitized and added to DigitalNC, courtesy of our partner, Western Carolina University. Stretching from 1927 to 1988, these maps detail the Blue Ridge Parkway, the Great Smoky Mountains, Jackson County, the Appalachian National Scenic Trail, and more. A section of the master plan to WCU, dated April 1978. E.J. Whitmire Stadium is in the top right. There is a huge amount of variety in the maps in this batch. One map from 1930 includes planting and sectional plans for the Rock Garden Memorial at Western Carolina University. Other maps, such as the Cullowhee Quadrangle Map, were commissioned by the Tennessee Valley Authority to map entire towns like Cullowhee, Sylva, and Dillsboro and mountain ranges. Several maps were double-sided, and included local information or scenic photographs of interest on the reverse side. This batch also introduces orthophotos to DigitalNC, the first of their kind on our website. Aerial photographs that have been scale-corrected for use in geographic information systems (GIS), these orthophotos show us how Jackson County looked from above in the 1980s. 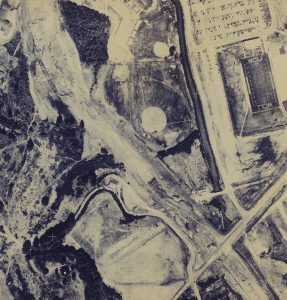 As you can see, the 1980 orthophoto featured below corresponds to how WCU was plotted out in the master plan above. The equivalent orthophoto of the above master plan showing WCU, dated April 1980. E.J. Whitmire Stadium is in the top right. The majority of the maps from this collection detail the Blue Ridge Parkway throughout western North Carolina and Virginia, drawn by the Department of the Interior National Park Service between 1942 and 1967. We also have the privilege to include eight segmented maps of the Appalachian National Scenic Trail from the 1980s. All of these maps and additions represent an important addition to our collection of knowledge about the Appalachians. To see more materials from Western Carolina University, visit their contributor page or visit their website. 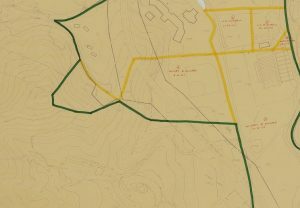 Almost a hundred new maps and blueprints have been digitized and added to DigitalNC, courtesy of our partner, the Chapel Hill Historical Society. Dated from 1875 to June 2007, these maps illustrate how much the city of Chapel Hill and Orange County has changed in the last century and a half. A map of how Chapel Hill would have appeared in 1818. Franklin St and Columbia St are featured. This new batch contains many different types of maps and blueprints, including maps of Chapel Hill neighborhoods, site plans for individual properties, blueprints of the Chapel Hill Public Library and its additions, maps of the city’s outer limits, and township tax maps. Beyond recent maps of Chapel Hill, this batch also includes several other interesting items. One map sketches Orange County, as well as the neighboring counties that ceded land between the years of 1752 and 1849. Another sketches the state of North Carolina as it appeared in 1753, when Anson and Rowan Counties stretched to the west. 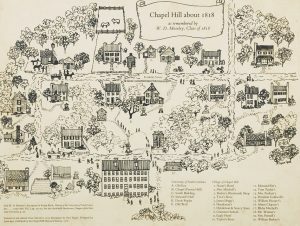 Another map, from 1976, sketched Chapel Hill as it would have appeared in 1818. Other items in the collection tell their own Chapel Hill stories. In 1925, R.L. Strowd, a local landowner, sold a number of lots throughout Orange County, and those deeds of land sales are also included in this collection. Another record of land sale is included, when Samuel Morgan sold land to Jesse Hargraves in 1845 for the cost of $4,300. This batch of items also includes a book that contains detailed maps of the Chapel Hill and Carrboro area from the 1960s through the 1980s, as well as an informational pamphlet from 1953 advertising the Lake Forest neighborhood of Chapel Hill. By adding yet more maps, blueprints and artifacts to our collection, we can learn and understand more about the city that DigitalNC calls home. To see more materials from the Chapel Hill Historical Society, visit their contributor page or check out their website. 8 years and over 400 issues of The University of North Carolina News Letter has been added to DigitalNC., courtesy of the University of North Carolina at Chapel Hill. We previously digitized issues of the News Letter from its inception in 1914 to October 1920, but the new addition brings our collection into November 1928, more than doubling our collection. 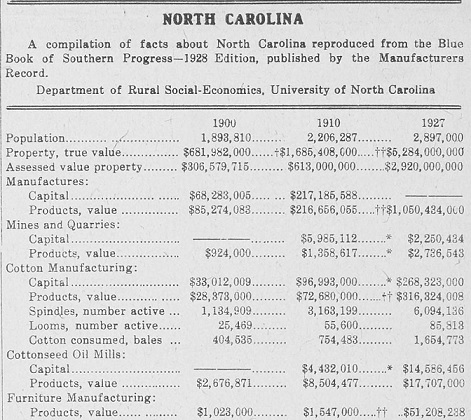 A 1928 chart of facts about NC, including population, property value, manufacturing value, and more. Published by the UNC Bureau of Extension, this News Letter was delivered to students weekly. As a single sheet distributed once a week, the News Letter gave the students of UNC information about local news, state and national news, and everything they needed to know in a quick read. In one 1921 issue, the News Letter included information about how millions of dollars were directed for public highways, New Zealand’s national debts, the amount of money North Carolina paid in taxes to the federal treasury the previous year, and words from the state governor about the ongoing economic crisis. These issues are very economics focused, with many including graphs and charts of money and taxes, population information, and more. To see other materials from UNC-Chapel Hill, check out their partner page, or visit their website. A new batch of yearbooks from Boonville, North Carolina is now available on DigitalNC, courtesy of our partner, the Boonville Community Public Library through the Northwestern Regional Library. Included are over 20 yearbooks from Boonville High School, stretching from 1939 to 1967, and a 1993 booklet detailing the history of the Quaker community at Deep Creek. These yearbooks contain individual portraits, faculty portraits, class portraits, and photographs of student activities, including clubs and sports teams. 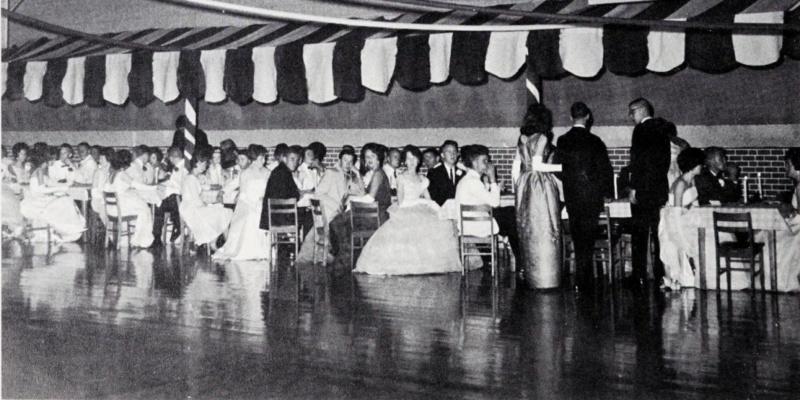 Some also include class histories, where they reminisce about their time at Boonville High School, “class prophecies” where the students predicted they will be in the future, and “class wills”, where students bequeathed their skills, abilities, or titles to incoming seniors and underclassmen. Because this collection contains yearbooks across nearly 3 decades, they represent a great transitional time in the school’s history. A booklet dedicated to the history of the Quakers at Deep Creek is also included in this batch. Written and compiled by Nancy Shore Reece Holt in 1993, this booklet tracks the history of the Deep Creek Friends as far back as 1781 and their time spent as a fixture of the community. It also includes cemetery listings and indexes of those who are buried at the Deep Creek Friends Meeting Cemetery. To learn more about the Boonville Community Public Library, take a look at the partner page for the Northwestern Regional Library or their website. A new batch of several yearbooks from Wendell, NC are now online and are available on DigitalNC, courtesy of our partner, the Wendell Historical Society. This batch of The Shield from Vaiden Whitley High School stretches from 1966 to 1968. As Vaiden Whitley High School was founded in 1966, this represents the first collection of yearbooks from VWHS, and allows us to see what its first students thought of the new high school. The 1966 Shield, a result of Wake County schools consolidating for integration purposes, made sure to note the importance of a wholesome school environment and supporting all students. These yearbooks include individual portraits, class portraits, photos of student clubs and lists of individual accomplishments, and more. Sports team accomplishments were also highlighted. For example, the 1968 Warriors team (right) defeated every team in their conference at least once to finish the season 17-9. These yearbooks provide a valuable window into what school life was like in Wake County at the time. To see more from the Wendell Historical Society, click here to view their partner page, or visit their website.